The pentagram, sometimes known as the pentacle or pentagon is in the shape of a 5 pointed star drawn with 5 straight strokes. 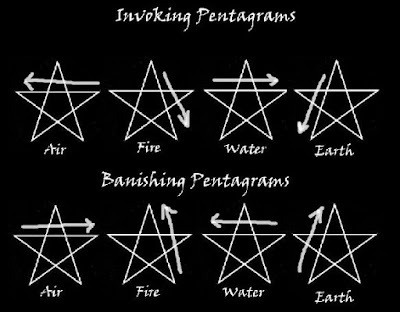 The word pentagram comes from the Greek word pentagrammon, with pente meaning 5 and gramme meaning line. The pentagram contains 10 points, the 5 points of the star and also the 5 verticals of the inner pentacle, plus 15 line segments. 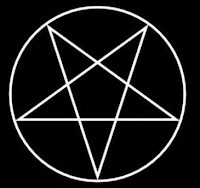 The pentagram also contains 10 triangles within it. The difference between the pentagram and the pentacle is that one has a circle around it and the other does not. 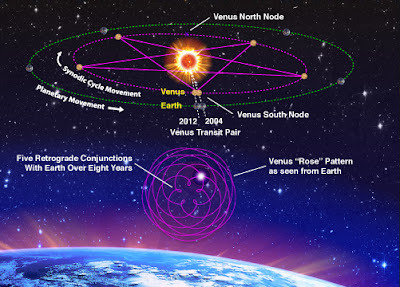 The apparent path of Venus as observed from the earth forms a perfect pentagram and this is why the pentagram is also related to Venus (the bright and morning star). The pentagram is also said to relate to the 5 virtues of Knighthood. The pentagram is also said the represent the deep connection our physical bodies have with the physical realm, earth and the 5 elements. In esoteric teachings when the pentagram is up right with the one point at the top, it means that spirit is residing over the 4 elements. Also it could be said that it represents the mind over matter. That we as a spirit being have control over our carnal desires, our bodies, the flesh of which is the temple of our soul/spirit which is related to the divine. The one point at the top also relates to the connection we have with the higher divine powers and is often called "The Seat Of Wisdom" which also relates to the Pineal Gland which is sometimes called "The Seat Of God". The Mormons also used the upright and inverted pentagrams in the art work of their temples. The pentagram was added to the list of 38 religious symbols excepted to be placed on tombstones of fallen soldiers that practised Witchcraft or Wicca in the U.S.A. 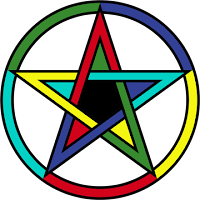 The pentagram is also featured on two national flags, Morocco and Ethiopia. The esoteric fraternity "The Order Of The Eastern Star" had an inverted pentagram as their symbol which also featured the colours, blue, yellow, white, green and red to represent the 4 elements, plus spirit. However, in some other esoteric fraternities, just to make things a little confusing the pentacle is represented by a hexagram rather than a pentagram. 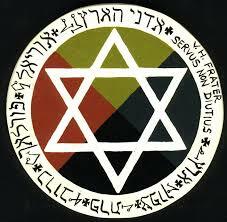 One example would be The Hermetic Order Of The Golden Dawn. 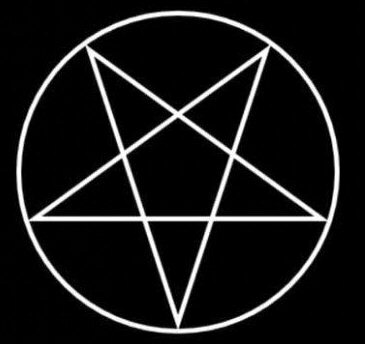 Within Satanism also the inverted pentagram is used, which represents the desires of the flesh and the body being in control of the mind which is opposed to the pentagram being up right. So in other words, you don`t control the machine (the body) the machine controls you. 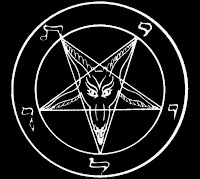 The inverted pentagram in Satanism can also represent the goat as opposed to the Christian religions lamb. The lamb being a representation of Yeshua (the Christ) and the goat being the representation of Satanas (adversary). 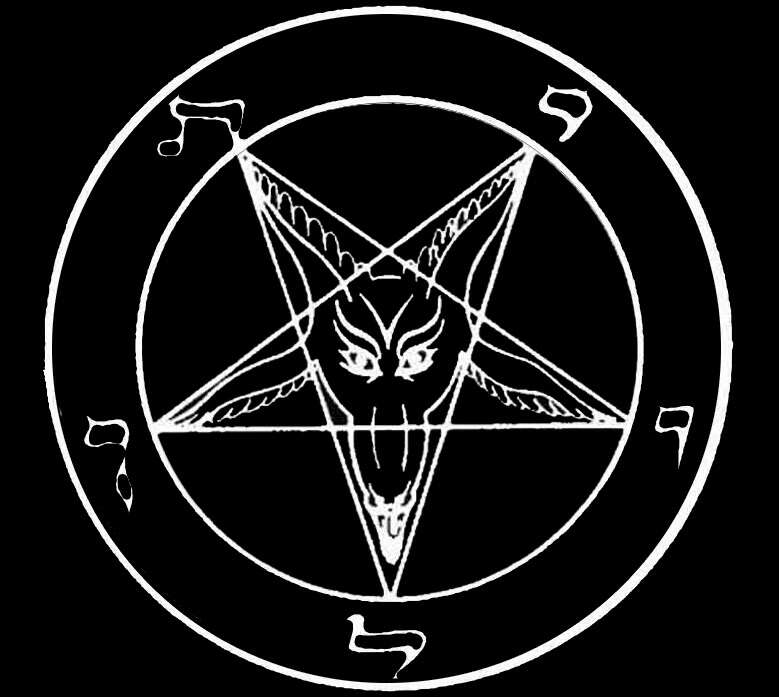 The two points of the inverted pentagram at the top represent the horns of the goat, the one point at the bottom being the goats beard and the points to the left and right side being the goats ears. A lot of people within Satanism relate the symbol of the goat to be Bathomet, a deity connected with "The Knights Templars". 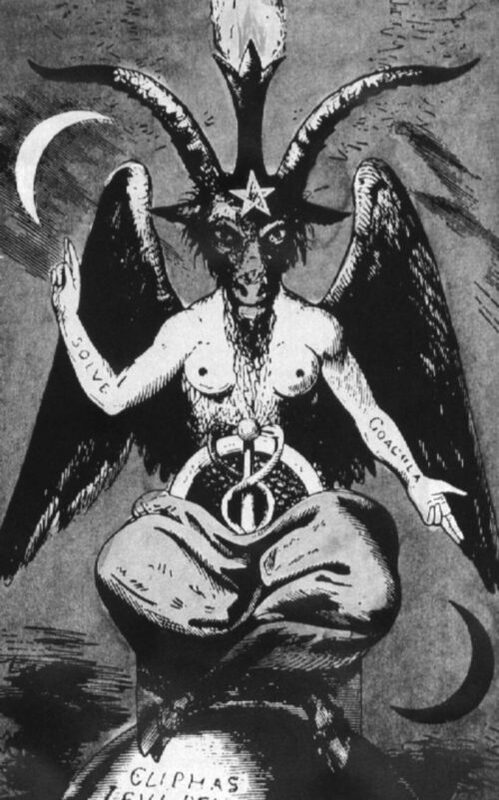 Modern Satanist often use Baphomet, as if connecting it to the religion of Satanism. However, in all truth the symbol of Baphomet has nothing at all to do with adversary or Satanism. The Symbol of Baphomet, which in itself has lots of different symbolism that needs to be understood to gain knowledge and wisdom into it`s true meaning and is a major study in itself. In Ceremonial High Magick there are different pentagrams to be drawn in ritual for different outcomes or results. These pentagrams are divided into two types of pentagrams, pentagrams for invocation/evocation and pentagrams for banishing. Firstly invocation/evocation means to bring something towards you and banishing means to remove something from you. Invocation means to call forth a spiritual being to show in a scrying tool for divination like for example a crystal ball, magick mirror or even yourself by channeling or possession. Evocation still means to call forth a spiritual being, but this time to show in physical formation in the room with you. As you can see in the diagram above, it shows 2 groups of pentagrams. The invoking/evoking pentagrams at the top and the banishing pentagrams at the bottom. 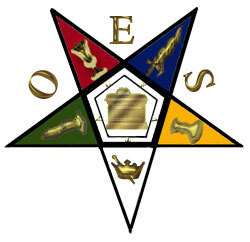 Here is where it gets a little tricky, the 4 pentagrams in the 2 groups are related to the 4 elements. 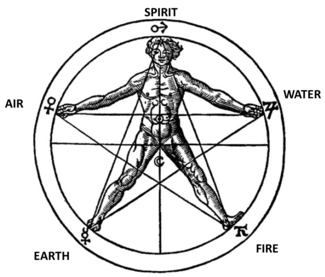 If someone wished to call forth a spiritual being they could use all 4 different invoking pentagrams for each of the cardinal directions,earth, air, fire and water. 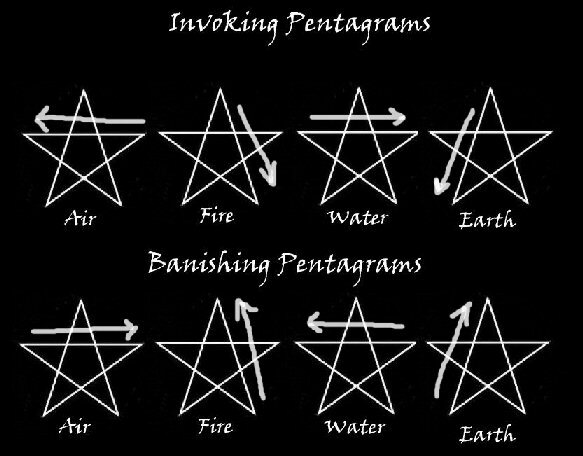 If someone wished to banish a negative spiritual being or energy from their home, they could use all 4 different banishing pentagrams for each cardinal directions. However, sometimes just the earth banishing or earth invoking/evoking pentagram is used for all directions. Also if you wish to have communication with one elemental or Archangel, say Michael, then you may wish to use just the fire invoking pentagram for all 4 cardinal directions. If say you wished to connect with all of the cardinal directions, then all the different invoking pentagrams would be used for their direction. 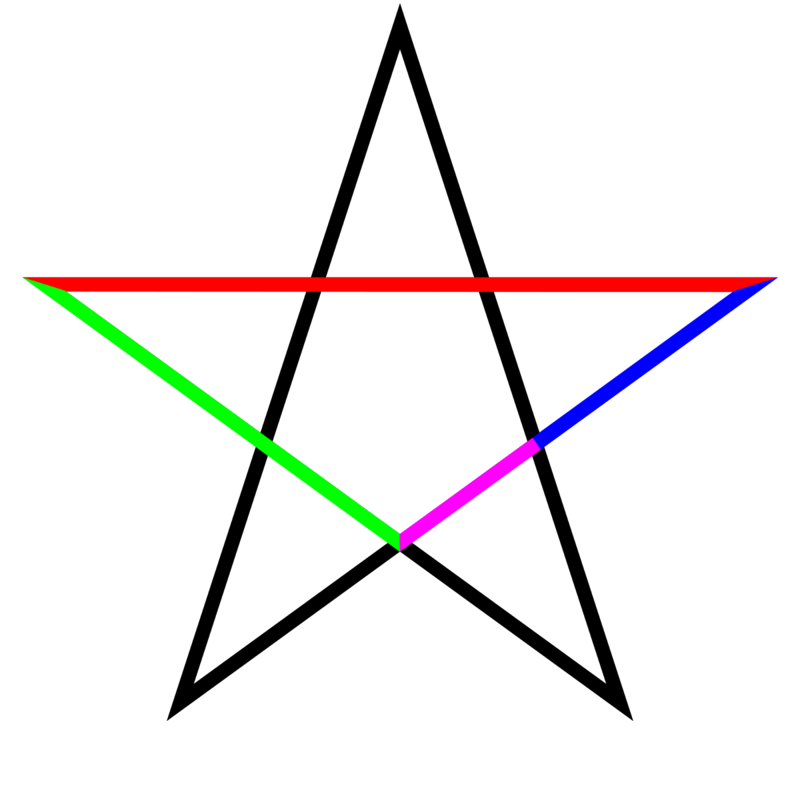 On drawing each pentagram in the air, it should be started where the end of the arrow is which is different for each pentagram. The pentagrams should then be traced in an unbroken line till it meets up with where it started. Also just to add a little more to this study, say for example you are standing in a cast circle and a pentagram is drawn within it upon the floor. 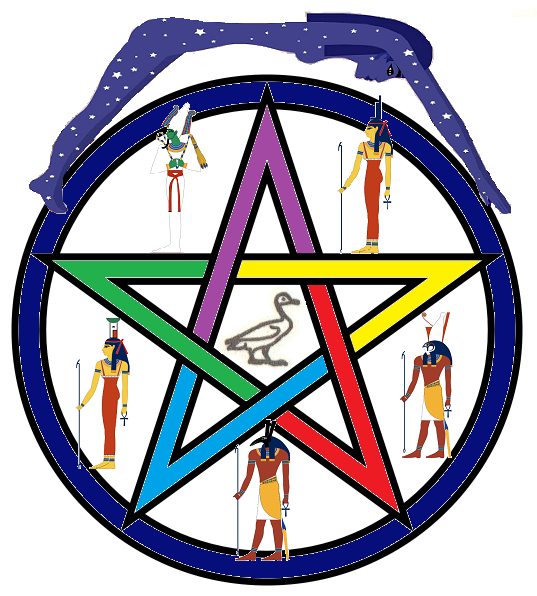 Not only is there the 4 cardinal directions, which would represent the 4 points of the pentagram drawn on the floor but there is also a fifth point, spirit. This is where 2 other pentagrams will most likely come into the ritual work. They are the active and passive spirit pentagrams, seen here below, for banishing or invoking/evoking. Thanks for showing an interest and reading this write up of mine. If you have any questions in regards to the information I posted here, please let me know in a comment under this blog thanks ~ Frater Orion Silverstar.